implementing the Displacement Tracking Matrix (DTM) project in July 2014. Working in close collaboration with the National Emergency Management Agency (NEMA) and State Emergency Management Agencies (SEMAs), IOM’s DTM programme worked to expand reach to the newly coverage in addition to addressing the needs of accessible areas and gathering accurate information on the caseload of internally displaced persons (IDPs). The need for immediate humanitarian response was escalated further with the Nigerian military liberating more areas that were previously under the control of the Boko Haram in the insurgency‐hit North‐Eastern State of Borno. major accessible areas that the DTM programme was able to reach in June. The total number of IDPs identified in Abuja FCT, Adamawa, Bauchi, Benue, Borno, Gombe, Kaduna, Kano, Nasarawa, Plateau, Taraba, Yobe and Zamfara as of 24 June 2016 is 2,066,783 IDPs (344,564 households). The slight decrease in the number of IDPs compared to the last round of assessment (2,155,618 IDPs) is mainly due to the fact that many IDPs returned to their LGAs of origin (Askira Uba, Damboa, Dikwa, Monguno, Kaga and Konduga) in Borno. Also one camp was closed in Damaturu in Yobe as per the request from IDPs who wanted to return to their places of origin. 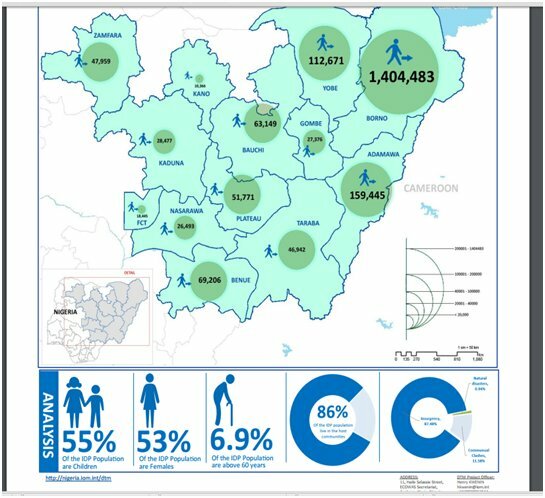 In Borno, Maiduguri LGA is hosting the highest number of IDPs (693,392), while most IDPs in Adamawa and Yobe were found respectively in Michika (27,512) and Damaturu (25,338) LGAs. population and more than half of them are under five years old. Source: NEMA Nigeria/ IOM July 2016.